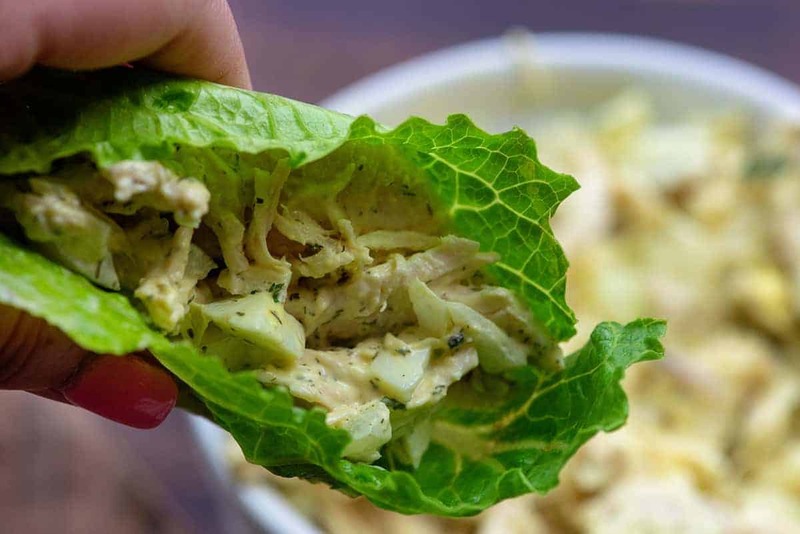 Keto chicken salad is a favorite for lunch in our house, whether it’s eaten with a fork, in a lettuce wrap, or spooned on top of sliced cucumber. 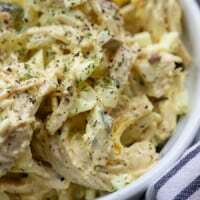 I load this chicken salad recipe up with all kinds of goodies so that every bite has loads of flavor and texture. When the sun finally starts peaking out and the weather finally starts warming up, I immediately start thinking of lazy summer days and firing up the grill. Summer food is the best food, if you ask me! In our house, we do a lot of simple lunches, especially during the hot summer months when we don’t want to mess with the oven or leave the pool. 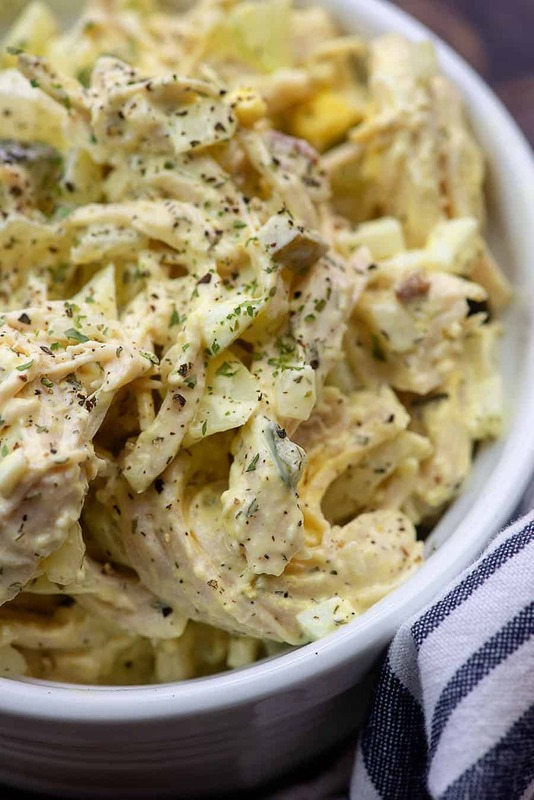 This low carb chicken salad is a summer staple for us, but we do eat it all year long. It’s hard to resist since I load it up with all kinds of goodies. This keto chicken salad is absolutely packed with all of my favorite things! I like lots of flavor and texture in my chicken salad. 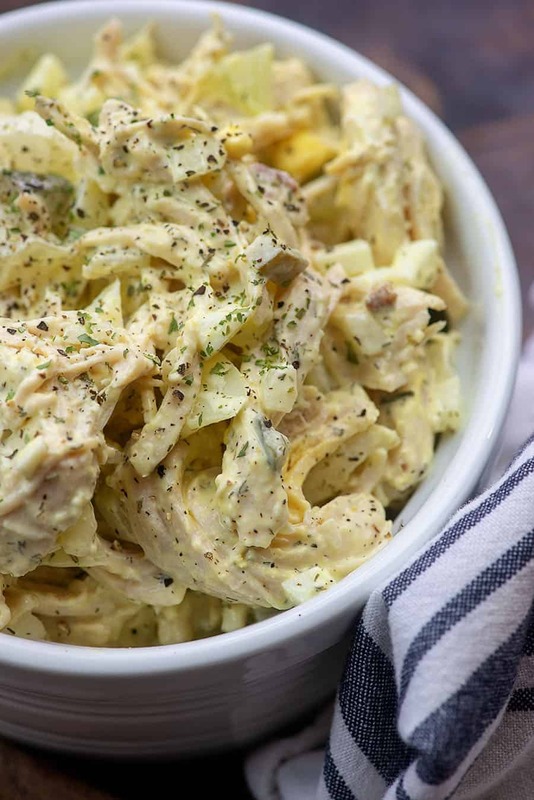 You’ll need shredded chicken, mayonnaise, mustard, hard boiled eggs, dill pickles, minced onion, chopped pecans, fresh dill, vinegar and salt and pepper. Feel free to sub in sunflower seeds or sliced almonds for the pecans. You may use dill relish in place of chopped pickles, but check for hidden sugars as a lot of relish contains sugar. We often start with a rotisserie chicken from the store to keep it really easy, but if you have an Instant Pot (affiliate link), it works perfect for cooking chicken to shred. 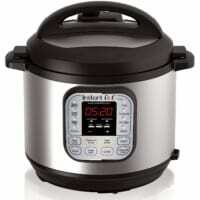 Just pop in a couple pounds of chicken breasts or thighs with a cup of broth and use the poultry setting for 15 minutes. 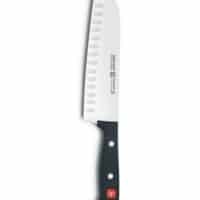 I always do a full natural release to ensure the meat is tender. It seems to get tough if you quick release. You can also throw your chicken in a slow cooker and cook it on low for around 3 hours and then shred it with a couple of forks. Let your chicken cool completely before mixing together your chicken salad. 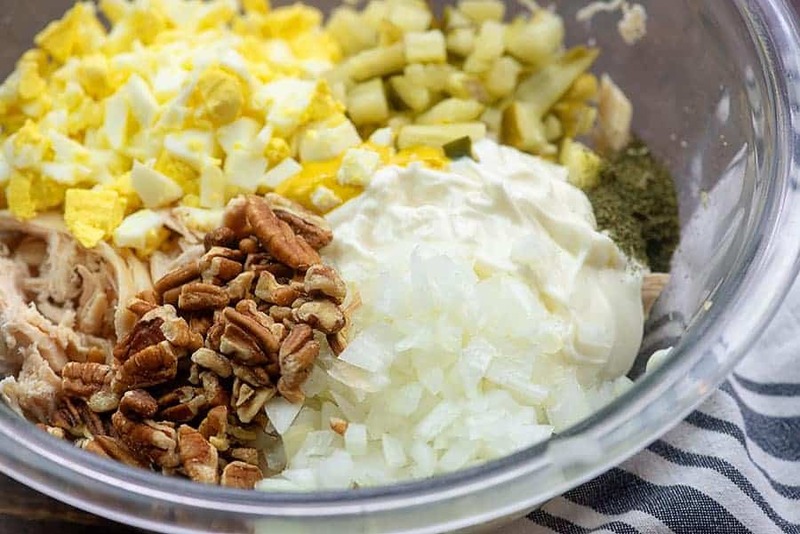 Stir together the mayonnaise, mustard, pickles, pecans, onion, dill, and vinegar and then toss in the shredded chicken. Give it a taste and add salt and pepper as needed. This tastes best after it’s had at least an hour to chill out in the fridge, but you can eat it right away if you’re in a hurry. Store tightly covered for 3-5 days. Everything in this chicken salad recipe is low carb, but traditionally chicken salad is served between bread. You could try your hand at this low carb bread recipe or, if you’re not strictly keto, you can check out some of the lower carb breads available at the grocery store. Healthy Life is a brand that’s widely available and has around 6 net carbs per slice, depending on the variety you choose. Low carb tortillas make a great wrap. I usually choose to serve my keto chicken salad in a lettuce wrap. Both romaine hearts and butter lettuce work well – romaine is crunchy and butter lettuce is soft. Choose whichever texture you prefer. I’ve also cut a cucumber in 1/4 thick rounds and spooned a little chicken salad on top. 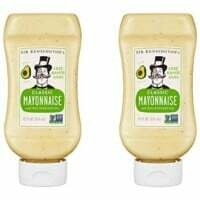 It’s delicious and adds great crunch. Stuffed Chicken Breast: You should read the reviews on this recipe! Low Carb Chicken Parmesan: A family favorite! Crockpot Chicken Fajitas: We all love Mexican food! Low Carb Chicken Casserole: Total comfort food! Lemon Garlic Chicken: The creamy sauce is seriously outrageous and so easy! 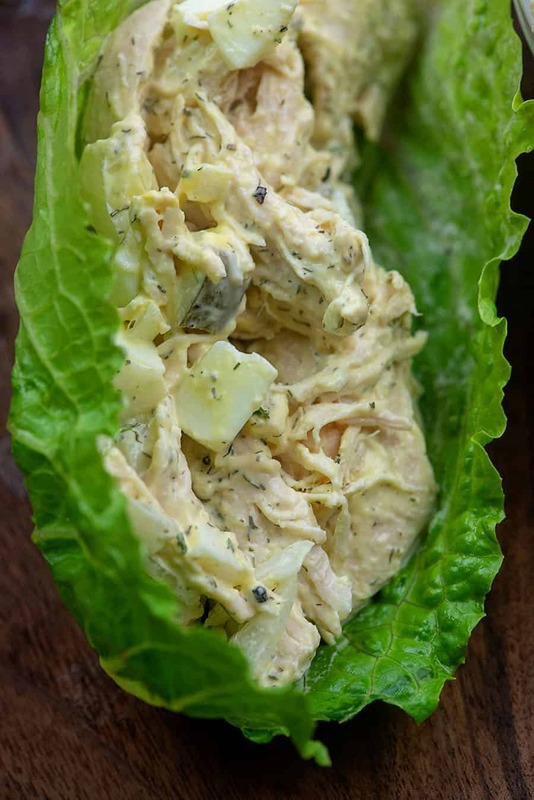 This low carb chicken salad is packed full of goodies to add major flavor! Add everything but the chicken to a mixing bowl and stir well to combine. Add the chicken to the mixture and stir well to coat. Taste and add salt and pepper, as desired. Chill for 1 hour before serving for best flavor. I will try the cucumber chip idea, love fresh cukes. You can also poach your chicken in broth for 30 minutes and cool and shread.